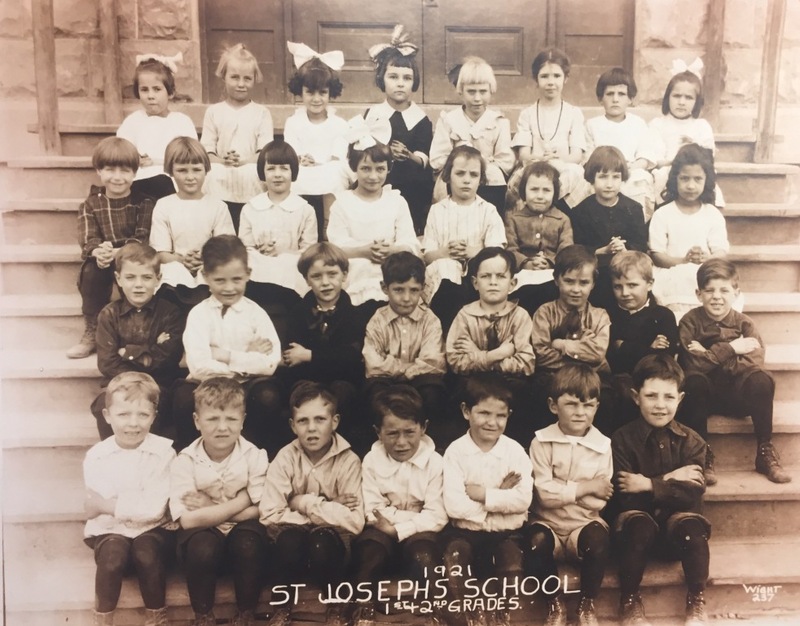 Holy Family Catholic School was opened as St. Joseph's School in 1916 by Fr. Thomas Conway and two Sisters from the Sisters of Charity of Leavenworth, Kansas. Thirteen students attended classes in the stone building, which had three stories with classrooms on the main level, a parish hall on the lower level and the auditorium on the upper level. By 1931, enrollment had grown to 153 pupils. Due to the high enrollment and lack of space, the school had to turn some students away. Students did not pay tuition and the teachers’ salaries were paid through an envelope system maintained through a church committee. Textbooks were provided through the efforts of the Catholic Daughters. The Sisters lived at St. Mary’s Hospital and traveled downtown each day by bus. In 1951, St. Joseph’s was remodeled and eight classrooms added, increasing the capacity of the school to 200 pupils. In 1964, Immaculate Heart of Mary Parish opened a new elementary school and a junior high in a building east of the church. The junior high functioned until 1970 when it was closed due to a shortage of teaching Sisters. Immaculate Heart of Mary Elementary continued for another four years until it united with St. Joseph’s School to form Holy Family Catholic School. Holy Family Catholic School continues the tradition of Catholic education that began in 1916 with a current capacity of 450 students in grades K-8 and the preschool and pre-kindergarten program. The Sisters of Leavenworth staffed Holy Family until 1996 when a team of lay administrators was hired by the school board to replace the Sisters of Charity. The current administration, faculty and staff continue the Sisters’ legacy with a dedication to maintain quality Catholic education in a small school atmosphere.